This may be the best kept secret in Allentown, because Hudson is a street of undiscovered marvels. Look at the wasp-waisted cut-outs supporting the porch floor under No.360, and don’t miss the exceptional detail of the pilasters and window cornices of No. 367, which are curtained by a porch made of three semi-elliptical arches. Fine paired brackets support the roof of this fine little rkman’s cottage. At No. 376, the exceptional bracketing under the eaves and the finely detailed porch should catch your eye. No. 377 Hudson is a Painted Lady whose second floor window pediments house cutout foliate designs, while a fine geometric cut-out creates a frieze banding the porch roof. At No. 382 is beautifully restored Queen Anne. Pay particular attention to a third-storey semi-circular blind arch housing a truly fine foliate carving of Art Nouveau vintage fanning over a recessed four light window separated by simple mullions and supported by two Doric columns. Don’t fail to notice the dentilated cornices over the first floor segmentally arched windows, and the restoration work in progress in No. 384. Hudson Street is an entry way into Allentown (the section of Hudson Street between Cottage and Wadsworth Street is part of the Allentown Historic Preservation District, listed on the National Register of Historic Places). Hudson Street is the only pedestrian access point to LaSalle Park on the Niagara River. Hudson Street was originally part of the Village of Black Rock, annexed by the City of Buffalo in 1853. Hudson Street’s original name was Delaware Street, being part of Black Rock’s 14 “state” streets (in order from downtown: Georgia, Carolina, Virginia, Maryland, Delaware (later Hudson, forfeiting the name to Delaware Ave. in Buffalo), Pennsylvania, New Jersey (later Jersey), New York (later Porter), Connecticut, Vermont, Rhode Island, Massachusetts and New Hampshire (later Hampshire)). These state streets represented the original 14 states of the Union (apparently South Carolina and North Carolina are represented by the one Carolina Street). Hudson Street originally stretched from the Erie Canal (where the NYS I‑190 is today) to College Street (Wadsworth St. was added later). There is no record of why the name Hudson was chosen to replace its original name of Delaware St. It may have been named for prominent Buffalo attorney John T. Hudson (1811‑4/16/1887) who owned a significant amount of land on Hudson Street near the Erie Canal, or it may have been named for the Hudson River, which was the Erie Canal’s eastern connector and a place Buffalonians thought of frequently in the 1820s and 1830s. The name may even have been a reference to the Delaware and Hudson Canal, which opened in 1829, linking the Delaware and Hudson Rivers and consequently the Erie Canal to the coal mines of northeastern Pennsylvania. Hudson Street is the ending demarcation of many of the old Black Rock/Buffalo streets (Whitney, 10th and Cottage) and the beginning demarcation of new streets heading northward (Fargo, Plymouth, and Orton). Some of the odd 45‑degree angles of the street intersections are due to the meeting of the grid design of Black Rock’s streets and Buffalo’s radial street design (Cottage at Hudson and Maryland Street as it joins College). The Village of Black Rock included the “One Mile Strip,” roughly a one mile boundary along the Niagara River purchased from the Native Americans. While Hudson Street began to be settled in the 1830s, most of the street was developed immediately following the Civil War when the city experienced an economic boom and residential areas ventured north from its downtown core. The south side of the street (odd numbers) was primarily developed between 1864‑1868 on land owned by Thomas Day. Many Buffalonians built here and at the time, this area was considered quite a trek from the industrial waterfront. The north side of the street (even numbers) was developed primarily during the late 1870s and early 1880s. While the street suffered from disinvestment in the 1960s and 1970s, many significant and irreplaceable structures remain. At the northwest corner of Hudson Street and Wadsworth Street is the well‑known institution, Friends of the Night People, “A shelter of last resort” for those in need. Many years ago, the building was a neighborhood grocery store. During the Great Depression, it was known as the Nettie E. Messer Smith Grocery Store. The KCA area is well known for welcoming diversity in its midst and Friends of the Night People has been a part of the neighborhood for over 20 years, providing a needed service to anyone who is hungry. Friends is open seven days a week, 365 days a year and serves more than 200 meals daily and provides emergency health services to 1,600 people annually. 390 Hudson Street was a small Italianate frame cottage that had been abandoned for several years. It was demolished in 1998 and the fate of the lot remains undecided, although it is owned by the City of Buffalo. 388 Hudson Street is a small cottage built in the late 1870s. It is an exemplary small cottage dwelling notable for its fine arched windows. It is also notable for its adaptive use in which the basement has been turned into a garage for an automobile. 382 Hudson Street is a home that is owner‑occupied and is notable for its detailed third storey window and Art Nouveau foliate carved fanning in the gable. The house is also important for its dentilled cornices over the first floor segmentally arched windows. 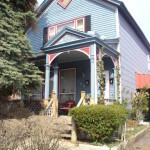 A new Victorian‑inspired porch was replaced on this house in 1999. 377 Hudson is a good example of a Victorian house with Eastlake‑style details. The house’s second floor window pediments incorporate cutout foliate designs, while a fine geometric cut‑out creates a frieze banding on the porch roof. The porch was restored in 2001. The house at 376 Hudson is one of the older homes on the north side of the street, being built in the late 1870s for Samuel Graves’ family. Graves was employed by the Birge Wallpaper firm on Niagara Street. The house is notable for its exceptional bracketing in the eaves and detailed front verandah which would be difficult to duplicate today with the same level of craftsmanship. 375 Hudson is another beautiful Queen Anne style home that was built in 1884. Today this is the home of Marianne Cassidy, KCA block captain for Hudson Street. The land upon which this house is built originally belonged to its next door neighbor at 371 Hudson Street. Charles W. Colyer, a physician and principal of school 18 built the house in 1865 on land he purchased from Thomas Day. While this home has been modified somewhat, it still retains its original porch as designed nearly 135 years ago. The homes at 370 Hudson Street and 366 Hudson Street are examples of the danger of drug elements in a neighborhood. Both houses were owned by absentee landlords and were suspected drug houses. Although they are calm now, they were notorious in the neighborhood during 1997. 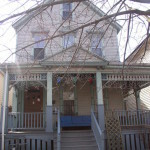 370 Hudson Street, the two‑family home that was a HUD house, sold in 1999 for $1,255. Since that time, it was purchased by a neighborhood resident on Hudson Street who is in the process of renovating the property. 366 Hudson Street is also in the process of being renovated. The small house at 367 Hudson Street is a fine example of a worker’s cottage built in the late 1860s and is notable for its exceptionally detailed pilasters, window cornices and fine paired brackets in the eaves. It also was notable for its verandah that featured three semi‑elliptical arches, but unfortunately the verandah was demolished in 1998, although it began to be rebuilt by its owner starting in 2002. 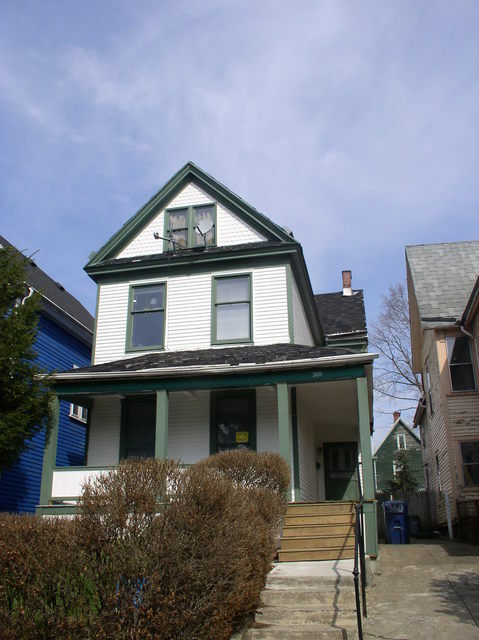 The house at 364 Hudson Street is an interesting example of architecture and Buffalo history. 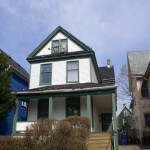 It was built in 1880 and its steeply pitched roof and carved window moldings are good examples of the style of architecture popular in Buffalo during the late 1870s and early 1880s. During the first 12 years of the building’s existence it served as the home for two distinguished mariner families: James J. H. Brown and later, Thomas Maytham. Maytham lived here until he built the mansion at 26 Richmond on The Circle. The house is planned to be renovated by Ted and Sherrill Flemming and has been re‑designed by architect Peter Nowak. The house at 363 Hudson Street is a charming home. The house was built circa 1867‑1868 by John M. Winter, a bookkeeper with I. S. & L.G. Newton, lumber dealers. Winter sold the house in 1872 to Edward J. Atkinson, a soap manufacturer. An immigrant from England, Mr. Atkinson studied the soap business in Montreal, relocated to Buffalo and became a partner with Isaac Wheeler in his soap factory. Beginning in 1858 he managed the business himself until he retired in 1875. He lived at 363 Hudson Street for about 12 years from 1872 until his death in 1884. Typical for the Victorian period, the wake and funeral was held in the house. Mr. Atkinson was noted as being “an estimable man of the somewhat old‑fashioned but sturdy, honest kind.” Mr. Atkinson would be pleased to know that his former home retains its 19th century charm and its mid‑Victorian appearance with the exception of a picture window installed on the second story. Sadly, the house was abandoned in 2004 and vandalized. It was sold at auction in 2005 and the community hopes that it will once more be restored. The home at 360 Hudson Street is notable for its wasp‑waisted cut-outs supporting the verandah floor. If the two houses at 357 and 359 Hudson Street seem newer than their neighbors, it’s because they are. Both homes were built about 1880 on part of a large lot that belonged to 353 Hudson Street, a substantial Italianate house built in 1865. Both of these houses were advertised for sale in the September, 1887 edition of The Real Estate and Builder’s Monthly by agents Hume and Sanford and were described as “357 and 359 Hudson Street, each 2 story frame, modern, lots 28 x 114, $6,500.” 357 Hudson Street was sold at auction a few years ago for approximately $4,000. 359 Hudson was abandoned in 1999 and is in terrible condition. It has been put up for auction numerous times by Erie County and The City of Buffalo with no takers. It is currently on the City of Buffalo’s demolition list and will likely be demolished in the near future. No properties were found on this street.